Every fall there is usually a field trip to observe the fall migration of waterfowl and smaller birds. The waterfowl trip typically takes us southeast of Prince Albert on the highway to Birch Hills and towards Melfort. Once the South Saskatchewan River is crossed, roads to the south will lead to Struthers Lake and Jumping Lake and then to Kinosis Marsh. 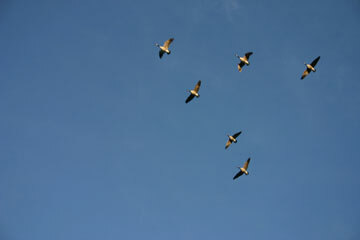 Huge flocks of geese are a general occurrence along with a number of bald eagles and many other migrants. If one wishes to observe warblers and other smaller migrants, then a trip to Prince Albert National Park is organized.